When was the last time you cried? It might’ve just been this morning, or maybe it was several weeks ago. This verse has been a comfort to the millions of us who have experienced suffering and loss in this life. Jesus said, “In this world you will have trouble,” which often means pain and grief accompanied by tears (John 16:33). While we often wish we didn’t have to experience it, we can take great comfort knowing that the pain of this life does not go unnoticed. Whether our hurts are skinned knees, broken bones, or broken hearts, we often feel alone in our sadness. We wonder if anyone has ever hurt like we do right now. Does anyone see me and understand? Jesus our Savior suffered all alone. Even His Father was silent, distant as the sins of the entire world were piled on top of Him while He hung on the cross. His wounds, His pain, His loss were beyond comprehension. Because of His very human experiences of pain, He knows how we feel. 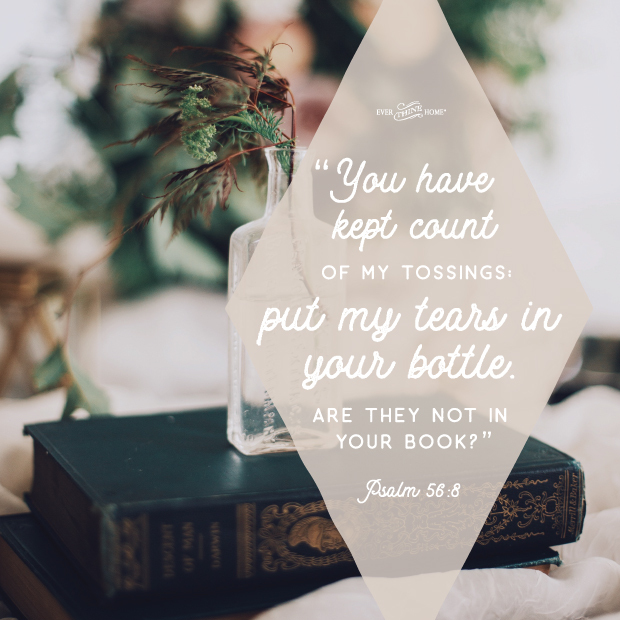 But He does so much more than simply identify and give a pat answer, “I know how you feel…it will be okay.” The great, majestic, holy God of the universe tells us that He collects our tears and keeps them in a bottle. He touches our hurt in a very personal way, recording all our sufferings in a book. This is another category of books in God’s library. What do you think might be the title of these books? Will we who know Jesus some day go to God’s library, find the book on the shelf where our name is recorded, open it to our page and read all that God wrote about us, even wounds and losses we’ve already forgotten? -What sufferings and losses has He recorded in His book for you? -Does knowing He collects your tears make you feel more loved by Him? -Pray together with your family, thanking Him for how personally He cares for you by name. What a wonderful thing to know that God cares about our tears. Sometimes I forget how much my tears mean to Him. What a comfort. I hang on to this daily as have been going through ongoing painful struggles for 15 plus years with no end in sight except by a miracle from the Lord and through the eyes of faith. I pray for this miracle and hang on to hope as I can, and other times just getting through the day is a victory. In the end I know and trust that God has a purpose and I am comforted to know that the God I love is so deeply tender and compassionate towards me. I hang on to the knowledge that He wastes none of my suffering but uses it all for a good purpose, no matter how deep it cuts or even if it is never resolved in this life. Hi – Do you have the image with the Psalm 56:8 Scripture inscribed available for purchase? It would be a nice gift. My daughter is in the hospital with severe bipolar disorder. She went in yesterday. Mental Illness is such a hardship with so much of it kept in secret pain. I had never seen the verse about our tears being so precious to God. And I loved the explaination of the significance of bottled tears in biblical and middle eastern culture. Thank you Barbara for sharing that verse. God used it to help me today since I have a hard time and tend to shed many tears when my precious daughter is so sick.What a comfort to know He has overcome the world and my daughter will be made whole again if not in this life but in eternity to come. Praise God!!! May our Heavenly Father carry you and your precious daughter through this great hardship. I am so very sorry. Won’t Heaven be so wonderful where we will all be whole!!! Truly comforting for those of us who have experienced grief in our lifetimes. I hung onto this beautiful verse during those times of grief. Thank you for sharing, Barbara. I just returned from my first trip to Israel and learned from a tour guide about an ancient custom of putting one’s tears in a bottle and sending it if one couldn’t attend the funeral in person. “It is a known fact that in Bible lands and other middle-eastern countries there was a tradition that when someone died, tears of those present were collected and placed in a bottle. This bottle was considered sacred for it represented all the sorrow of the family and was buried with the deceased. Many of these bottles have been found in ancient tombs. In ancient Rome, mourners filled small glass vials or cups with tears and placed them in burial tombs as symbols of love and respect. Have you heard of any of these customs, Barbara? They give additional context to the beautiful Psalm verse. I lost my Grandparents both an hour and a half apart in February. They loved the Lord with their whole being. So amazing they got to meet our Savior together. Picturing them walking through the pearly gates they spoke often of, together! Wow! I have cried so many tears over losing them on this earth but I’m so thankful for my hope of Heaven! I get to see them again! And I know they are up there watching over me. My two children (10 & 9) had the privilege of knowing them. So amazing knowing the Lord collects all of our tears. And He has revealed Himself in mighty ways through my grief. Praise the Lord! I so appreciate this word today. My sister lost her husband at a young age to cancer in January. Though this was a tragic loss for us all, she is in a deep grief, feeling very alone and is sort of pushing us all away because we “can’t understand.” I don’t really believe her intent is to push us away but the communication isn’t there. We are trying so hard to give this all to God, to pray and realize her hurt is deep and that the effects of anything she says or does shouldn’t be taken personally but it’s really hard not to do so. She is a believer and so was her husband. 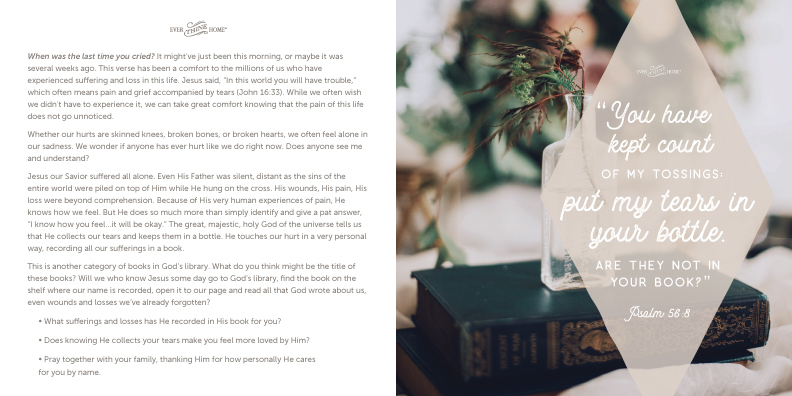 Thanks again for the reminder of a very personal God Who cares. Me too, Jen. So glad it was a comfort to you!